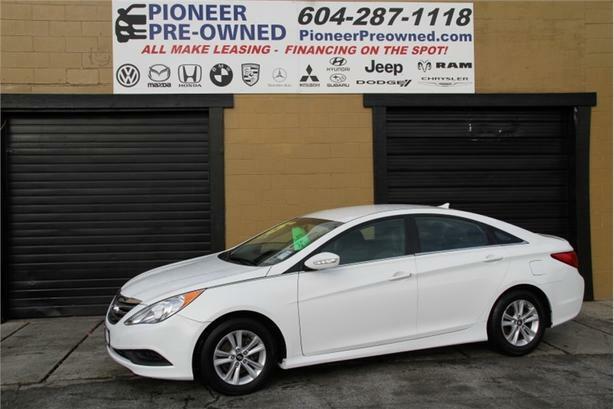 2014 Hyundai Sonata GL, This car comes with Bluetooth, CD Player, AM/FM Radio! Buying a vehicle can be a stressful time. WE CAN HELP make it worry free and easy. Hot Deal! We've marked this unit down $7300 from its regular price of $19888. When it comes to delivering everything you would expect from a midsize family sedan, this Hyundai Sonata doesn't disappoint. This 2014 Hyundai Sonata is for sale today in Mission. This Hyundai Sonata defines its competitive segment. It's a contemporary family car that gives you everything you could ask of a midsize sedan. The smooth ride keeps everyone comfortable and the excellent fuel economy lets you keep going without too many trips to the pump. This Sonata's excellent safety rating lets you drive with confidence. From your commute to your weekend road trip to everything in between, this Hyundai Sonata delivers where it counts. This sedan has 63520 kms. It's white in colour. It has an automatic transmission and is powered by a 190HP 2.4L 4 Cylinder Engine. This vehicle has been upgraded with the following features: Bluetooth, Heated Seats, Siriusxm, Steering Wheel Audio Control, Air Conditioning, Power Windows, Cruise Control. It may have some remaining factory warranty, please check with dealer for details.